Page 18/19 of Lionel company's 1949 catalog illustrating three train sets with locomotives modeled after the PRR S2 Turbine Steam locomotive. For many years young boys and girls and even moms and dads find that sentimental spot for the holiday train set buried in the attic that comes out once a year. The Lionel Train Company among others was no exception to many family holiday memories. What captured me as a child were the sleek lines of the PRR styled steam models, spark of ozone, and what seemed to be an intense noise for such young ears! Here are some samples from a 1949 and 1951 catalog the earlier stamped with Dealer "Wagners Roundhouse" of Pleasantville NJ, both courtesy of a close family member. Lets enjoy the memories of the Holidays past, and the excitement of Holidays to come! 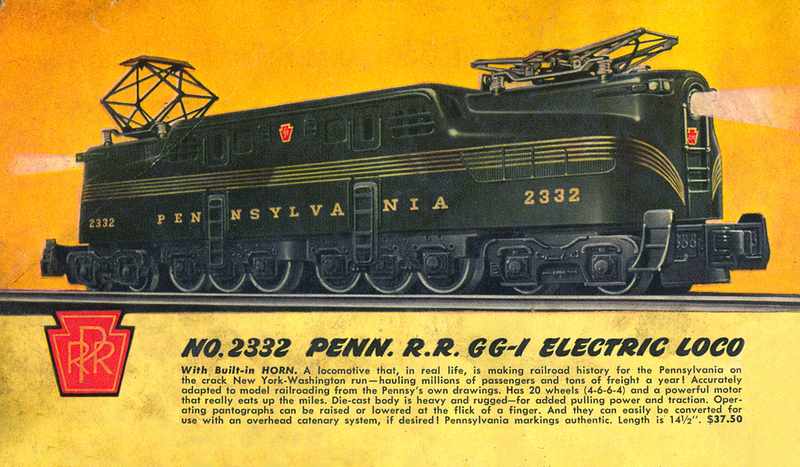 Page 26 of the 1949 catalog illustrates the mighty GG-1 model that measured in at 14.5 inches, a dream gift for every child to recreate the high speed stream-liners that delivered them to a vague destination of childhood travels with family. The center piece of the 1951 Lionel Catalog touts "a Rip Roarin' Giant, Lionel's famous Steam Giant" catalog# 2173WS train set included the PRR S2, automated milk car, unloading coal hopper, operating ore dump car, double dome Sunoco tank car, and illuminated caboose (cabin car to PRR folks! ).